“A sensory experience with authentic Thai cuisine” it says on the Thai Square restaurants website, “best Thai in London” so I was looking forward to sampling it. 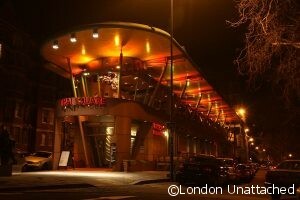 The Putney Bridge branch is within an unusual building whose exterior looks like a ship with metal beams and tall windows with its prow looking on to the bridge has won several architectural awards. At the entrance they were announcing the arrival of their new chef and the executive dishes. 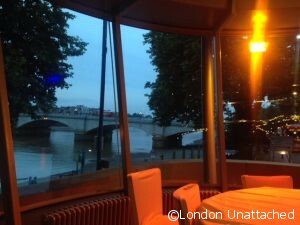 Knowing the location, I knew the restaurant enjoyed an enviable position on the corner of Lower Richmond road by Putney Bridge overlooking the river. So when we were taken upstairs it was good to see the most had been made of the location with large floor to ceiling windows giving open views of the river. 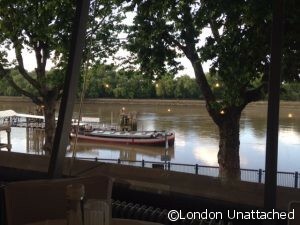 We were pleased to be seated on the river side with uninterrupted views of the river and the pier where river cruises go from. We had a good view up and down the river which changed as the light did during the evening. 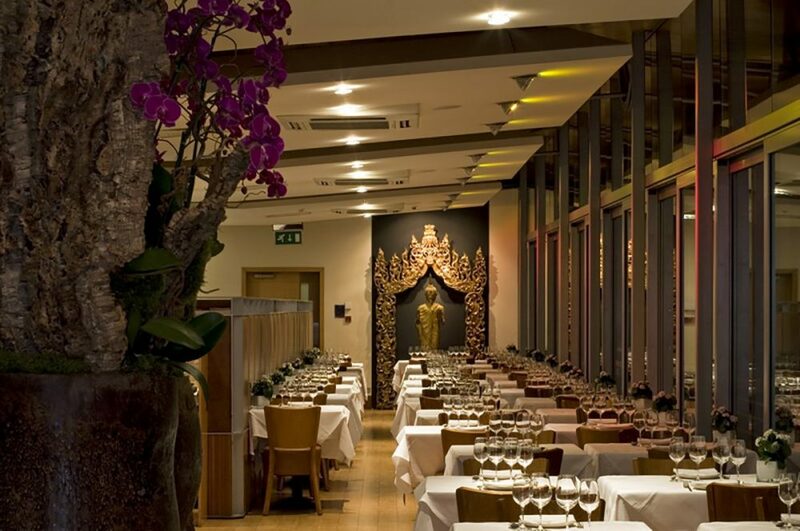 The interior is a mix of traditional and contemporary Thai décor with large Buddha, trees and gold finery. 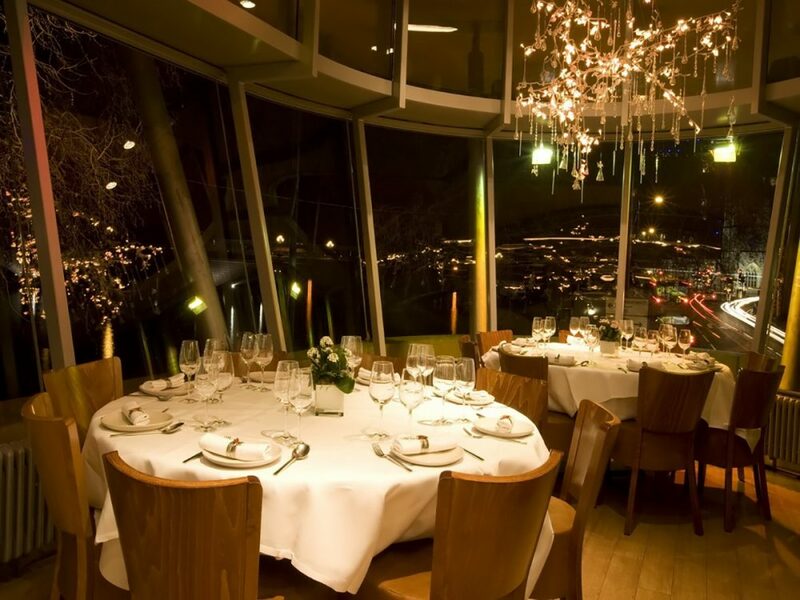 Overall the experience was visually pleasing with the combination of the view and the restaurant’s luxurious Thai decor. Personally, I like simple spacious tables covered with clean crisp white linen and quality cutlery and glass wear. The waiting staff were dressed in traditional Thai attire. I especially liked the men’s gold draped pantaloons. In true Thai style they were classy and exceptionally polite and attentive so with that welcome we were off to a good start. 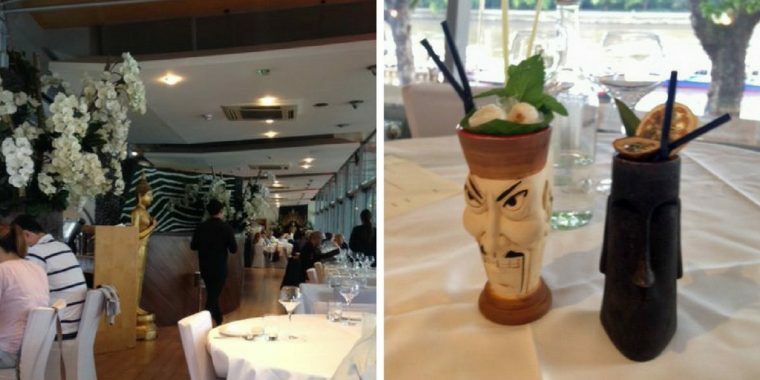 Having seen the Exotic menu of cocktails with more than a hint of SE Asia we were excited to try something different. 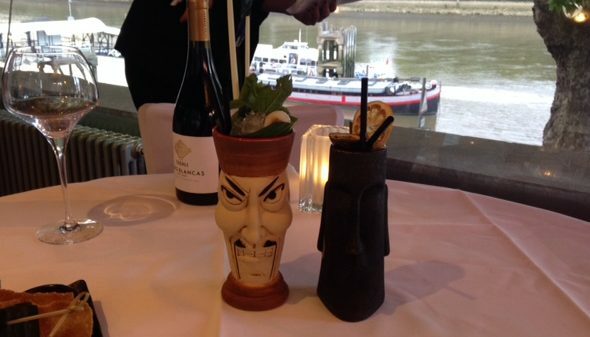 I went for what was obviously the signature cocktail, Thai Full Moon, which consisted of two types of rums, pineapple juice, lemon grass and more and it certainly packed a punch. Peter (aka The Veggie Man) decided to live dangerously with the Bangkok Dangerous, made up of two vodkas, ginger and lemongrass, fresh herbs, lychee juice topped with fresh lychees over ice. I actually think mine was far more dangerous in terms of strength and a few sips in I could feel it starting to take effect! The receptacles they were served in added to the experience. They were certainly different if a little scary! Made of clay, a cross between a Toby jug and a sculpture, mine resembled one of the Easter Island heads and the Veggie Man’s was more of Fu Manchu. The menu was extensive and in addition, there was a new executive style selection of dishes. All of these looked interesting and enticing. 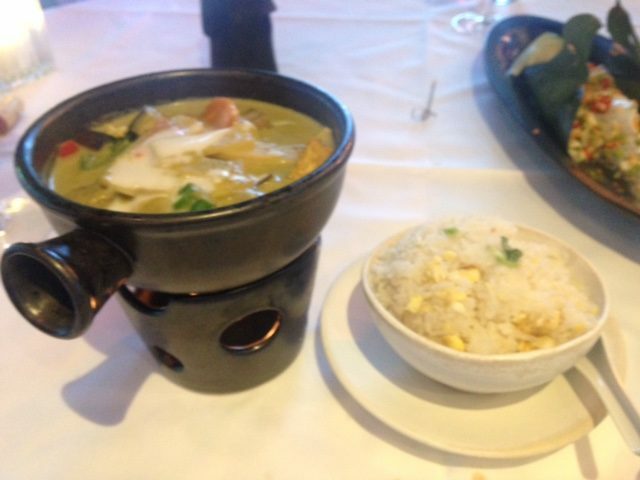 Again, I went for something completely different to my normal choice in a Thai restaurant. I’m fond of a hot green curry and rarely have fish so I even surprised myself. 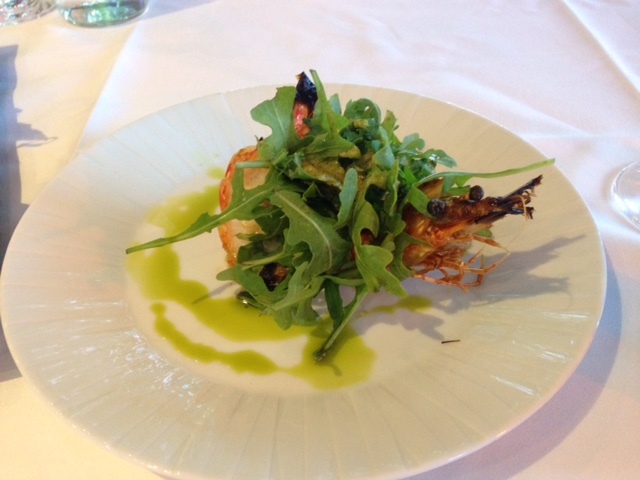 For starter, I had the Grilled Wild Tiger Prawn with a sweet basil parfait, rocket salad and radish (£12.95) which was delicious and beautifully presented. There just wasn’t enough of it and I probably only had a couple of mouthfuls from the one prawn, but that’s sometimes a good thing, more room for the main. The Veggie Man had gone for the main menu as there were no options for him on the executive menu. We were surprised by this although the main menu had more than enough for a veggie to choose from. He had the Mixed Vegetarian Starters (£15). Seldom do I feel I have lost out but I did this time. He gratuitously shared some with me as there was enough for two really. It was a platter of delights including a spicy salad in a banana leaf, Vegetarian spring rolls, Golden purses (cheesy parcels) Corn Cakes, Summer rolls etc. with plum and chilli sauces. 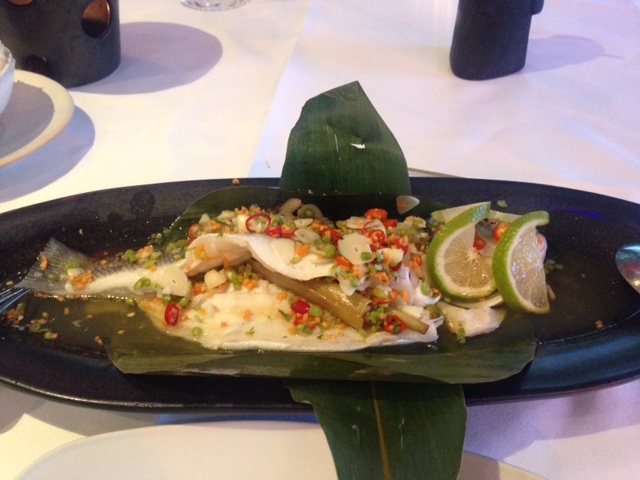 By the time we were served our main course, the restaurant began to fill up and there was a lively vibe around. 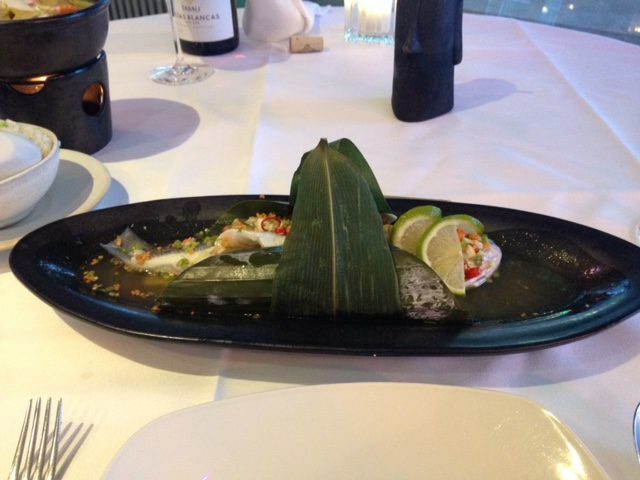 For mains, I had Whole Steamed Sea Bass (£26) with a galangal, lemongrass & kaffir lime leaf stuffing wrapped in banana leaf stuffed with a side order of coconut rice. It was exquisite. My gamble on fish for the main course paid off. It was light and a sensual delight for the mouth. I wouldn’t normally even mention the rice but I can’t stop talking about how amazing the coconut rice was too. For mains, the Veggie Man had the Vegetarian green curry and rice (£12:50) which packed a chilli punch with a spicy combination of fresh peppercorns, red chillies, white ginger, fried tofu, aubergines, oyster mushrooms, basil, bamboo shoots & long beans. The wine list consisted of well-chosen wines that were well suited to the type of food and was not full of mainstream producers. We went with a Chilean Pinot Noir Reserva which held its own with the curry but also light enough to accompany my fish. The Veggie Man rarely orders a glass of white! To finish we had a mango sorbet and a ginger creme brûlée. The sorbet was a sorbet. 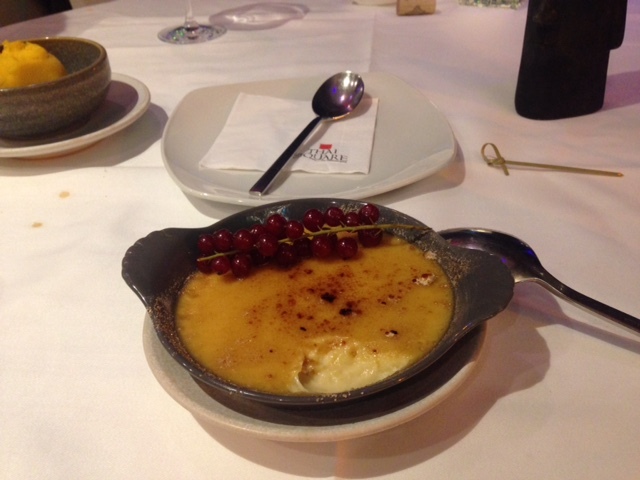 The creme brûlée was excellent, light and creamy with a hint of ginger and just enough burnt brown sugar topping. And it was large which meant I couldn’t quite finish it. A sign there had been ample to eat. 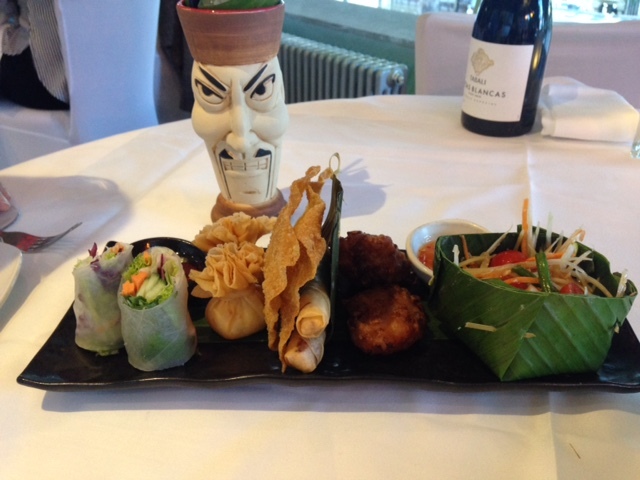 We agreed that Thai Square had lived up to its mission of authentic Thai food and a sensory experience and we would definitely return. Made by the setting it’s a classy and impressive restaurant which won’t break the bank and would be a good place to go for a night out with friends liking traditional and trendy.